Heat oven to 425°. Line rectangular pan, 13x9x2 inches, with aluminum foil; spray foil with cooking spray. Mix bread crumbs, parsley, lemon peel and butter. Cut fish into 4 serving pieces. Place fish in pan. Sprinkle with seasoned salt. Drizzle with lemon juice. Spoon crumb mixture over each piece; press lightly. Bake uncovered 15 to 20 minutes or until fish flakes easily with fork. 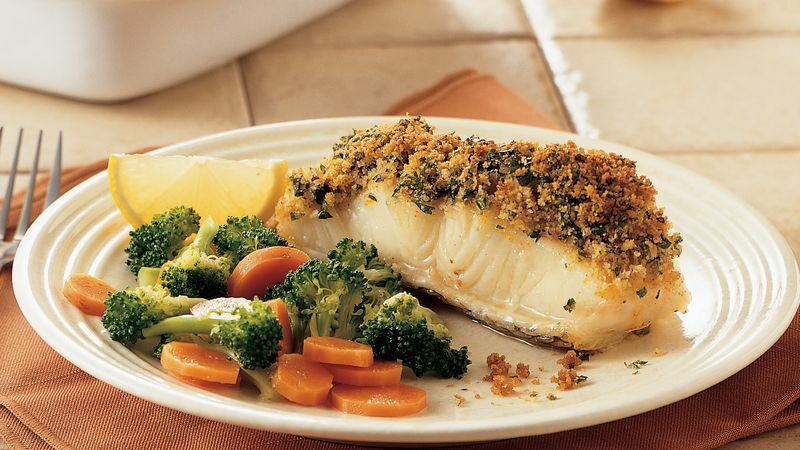 To save time, use purchased bread crumbs that contain garlic. If the brand you find doesn't list garlic on the label, add 1/4 teaspoon garlic powder to the bread crumb mixture.